Superb storytelling and strong gameplay help Rockstar’s western reinvent the genre for a new generation of (potential) fans. If there’s one genre that’s managed to avoid total exploitation, it’s the classic western. Blame it on shortsighted developers, but its absence in popular gaming culture has allowed developer Rockstar Games to take full advantage of this vacuum by crafting one of the most thoroughly complete and expansive games in recent memory. Taking several cues from their own Grand Theft Auto franchise, they’ve brought the same exhilarating sense of open-world freedom and exploration to their fictional wild west, coupling it with one of the most exciting scripts in gaming history. Of course, having a $100 million dollar budget doesn’t hurt, and boy do they make the most of it with the unofficial sequel to Red Dead Revolver, Red Dead Redemption. Revenge, Gun Fights, Explosions and oozing with cinematic detail and camera angles? Yeah, I knew I was playing a Rockstar game long before I finished my stint with Red Dead Redemption. They’ve has never been one to keep their nose out of instigating a little thought about how screwed up government and the people it governs are, or the law can be as twisted as those it prosecutes. This game is no exception, and often revels in the glorious depravity of a lawless frontier when men were packing, and salvation itself was up for grabs. Most of all, they try to remind everyone that honorable living sometimes means dishonorable killing. Set in the early twentieth-century, John Marston is a man with a family, a past he left behind that has come back drag him back into the depths of Hell, courtesy of none other than the United States Government. His family essentially ransomed in return for his service, John will find out that there’s a lot more to killing a man than simply just pulling out a gun and pulling the trigger. This concept of reverse-redemption isn’t an uncommon one in cinematic western mythology, but manages to feel fresh and vivid when applied to the relative open world expanse afforded by today’s most advanced technology. With a storyline that chronicles the last days of the frontier with aplomb, there’s nothing else quite like it. Red Dead Redemption takes the sandbox genre to a place its seldom been – the sand. Long stretches of lonely desert are punctuated with lively cities that bristle with activity the moment you set foot in them. The game runs on an enhanced version of GTA4’s “Rage” engine, and it’s pretty incredible how much attention to detail was put into recreating the nuances of this stylized wild west. The animation on both human and animal models is impressive (the best horses in videogame history, bar none), and the rest of the world has been crafted with such thoughtfulness you can’t help but be impressed. Technology nerds will argue that the Xbox 360 has the slight edge over the PlayStation 3 in performance and resolution, but the two are virtually identical in all regards. It’s worth noting the finished game is riddled with strange technical glitches and bugs, most notably character skins that don’t follow normal behavior. Don’t be surprised to see characters acting completely out of their element – or species – during your play time, as dogs will glitch into humans and horses can be seen flying through through the wild blue yonder. But while most glitches are simply harmless fun, the occasional game-halting ones (i.e. freezing) can really be a pain. Thankfully the game’s save and checkpoint system is uncanny enough to keep up with most of them. I’m hoping that future patches will alleviate many of these issues, but as of this writing they remain a constant – but not game-ending – annoyance. The location may be different, but despite its western motif, RDR still plays very much like a good sandbox game and should feel immediately familiar to fans of the GTA series. As you progress through the game’s gigantic world, while off-the-path events will often pop up to distract or expand from the main storyline, and your choice to participate is often left entirely up to you. These are where the real meat of the gameplay is, as most events play off some of the genre’s most iconic moments, such as standoffs, public lynching, and of course, many gunfights. Lots and lots of glorious gunfights. Menial jobs like hunting (and skinning) animals like rabbits, coyotes, deer and even that horse you accidentally shot are simple enough. Hunting down and tracking a bounty on the other end becomes a lot more difficult. A wide variety of different weapons are available to help even the odds, including rifles, knives, revolvers, and even cannons. Thankfully there’s a few helpful things John has on his side that don’t fire bullets but are just as useful. The lasso, which has multiple purposes outside of a little wrangling, such as using it to swing across spaces and chasms. The Dead-Eye feature is John’s bullet-time feature (a nice nod to Max Payne) that allows you to put more creativity in your shots, such as zinging off a man’s hat or the gun from his hand. Of course, more sinister types will opt for placing one square between the eyes, all of which are available to those looking to take full advantage of the myriad of gameplay possibilities. I wanted to take a moment and reflect on one element of the game completely and that’s riding on horseback. As mentioned above, the general lack of western-style games has limited such a potentially exciting transportation method to medieval and/or fantasy romps, with the most notable example probably Link’s faithful Epona in the Zelda series. But while most games usually botch things up, RDR borrows elements from GTA’s driving/shooting mechanics and simplifies them to near-perfection. When coupled with exquisite animation and handling, the result is the most exciting example of the art ever seen (and felt) in any game. Killing a man from long range with a Winchester may sound complicated, but the intuitive control scheme for horseback riding makes it so simple you get a sense of power from it. As we’ve come to expect, the game also features extensive online multiplayer options, and up to 16 players can compete in both free-for-all and team-based modes that’ll put your mettle to the test. There’s plenty of carnage to be found here, and as good as the single-player storyline is, there’s just something intrinsically appropriate about having the ability to engage in some old-fashioned standoffs that works really well. The various Capture the Flag options feature hilarious plays on the genre, including Grab the Bag, Gold Rush, and even Hold Your Own. 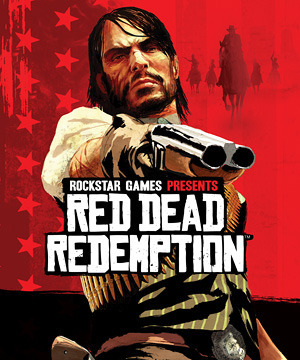 With Red Dead Redemption Rockstar Games hasn’t just added another masterpiece of narrated gameplay to their already impressive resume, they’ve easily topped themselves on nearly every front. They may have taken a major gamble by moving away from the crime-ridden metropolis of Liberty City to the desolate stretches of the wild west, but having one of the most compelling storylines in gaming history to guide the experience home was worth it. From wild gunfights to exciting horseback battles, there’s few things the game doesn’t excel at, and leaves you with an ending so strongly that you’re left holding the controller at the credits wondering what games matter to you anymore. Drew Misemer Popzara welcomes guest reviews, editorials, and other fascinating pieces of original content. Think you have what it takes to join the fun? Contact us and find out today!